He says he unloaded his portfolio to avoid conflicts of interest. The June decision also coincided with a cash crunch for his campaign, meaning it may have been a pair trade that paid off. Trump's commitment to ethics will be clearer if he divests his main business holdings. Rome is trying to keep a 5-bln-euro rescue of the stricken lender on the road. The best way to do so is to let retail investors take some of the losses. Protecting them from their just deserts will mess up future European bank rescues, and not just in Italy. The National Assembly ousted President Park Geun-hye amid a corruption scandal. Though politicians swiftly made the historic move, clouds will still linger over the Korean economy and markets. A court can shoot down the bill after a lengthy review. Overseas risks also abound. Donald Trump is challenging the ideals that have guided U.S. capital markets and corporate behavior for a generation. If it forces boards to reconsider the broader impact of their actions it may be a good thing. More likely, it will usher in an age of cronyism and quid pro quos. The president-elect mollified Beijing with his ambassador pick. The selection of Iowa Governor Terry Branstad, who has personal connections with Xi Jinping, calms waters troubled by Trump's tough talk. As other hardliners are brought in, Branstad will need to pack a surfboard. The Italian lender will sell a third of Bank Pekao to two Polish state-controlled entities. UniCredit needs capital, may share the upside via a sale of equity-linked paper, and Warsaw's hatred of foreign capital is a spur. Still, at 1.4 times book it's cheap versus some peers. Despite resigning as Italy’s prime minister after losing a referendum, there’s a way back for Matteo Renzi: a quick election. That could pit him against the 5-Star Movement, which wants a vote on the euro. Renzi may still have enough support to win, but would need to move fast. 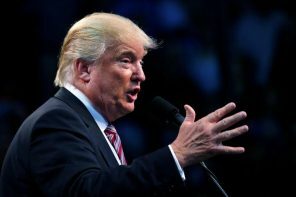 The U.S. president-elect said he dislikes what has happened to drug prices, and pharma stocks slumped. Hillary Clinton's views once carried similar weight. That's because the jabs are justified. Investors know there's too little innovation and too much reliance on raising prices. The Italian bank has secured a fifth of the 5 billion euros it needs in new equity by turning some bonds into shares. The priorities are to protect retail depositors and attract outside investment. Institutional investors, and Brussels, will both have to give a little. Gallic bonds are trailing euro zone peers. This suggests investors are worrying that the far-right's Marine Le Pen might do better in the 2017 presidential elections than polls show. Were her chances to improve materially, market damage would quickly spread across the region. The Japanese group is raising a tech fund twice that size, so boss Masa Son's promise to Donald Trump looks doable. It can also curry favour for his longed-for merger of SoftBank's Sprint and T-Mobile. But creating 50,000 jobs in the thinly staffed tech industry won't come easy. A bad-case Brexit might demolish some of the financial sector's record 71 bln pounds in tax contributions, outlined in a new report. Other bits of the economy could also suffer from the fallout. But bankers might gain more from an upbeat case for their salvation. The FCA is set to cap leverage punters can take when spread-betting. It shouldn’t have been a shock given EU peers had questioned a product in which 80 pct of clients lose money. Brokers’ 30 pct share falls imply they suffer from the same mindless optimism as their customers. Euro zone lenders agreed to rejig some of its debt, which adds to the likelihood that future financial support isn’t just good money thrown after bad. Greece is no longer pushing a rock up a hill, but some pretty hefty tasks still stand between it and economic recovery. The UK's top court may force the government to give parliament a say on triggering Brexit. Yet this wouldn't necessarily change Prime Minister Theresa May's plans much. Two related legal matters - including whether the exit process is reversible - might provide firmer resistance. The failed referendum need not cause a crisis if UniCredit completes its rights issue and fellow lender MPS can be quickly stabilised. Political turmoil and weak growth, though, could push up bad loan levels. A new "bad bank" would help, but political will may be lacking. Matteo Renzi resigned as prime minister after losing his constitutional reform referendum. The immediate challenge facing his successor is to make sure banks in need of capital still get it. Longer term, Italy will hobble on without the change-minded strong government it needs.